A great transformation is shifting the weight of global power, population and economic growth from what was once called the first world to what can no longer be called the third, and more precisely toward the middle income countries that are still, somewhat anachronistically, labeled emerging markets. Through that shift, enormous numbers of people are moving out of poverty into the “vulnerable” class. Living on perhaps $4 to $10 per day, they are not quite middle class, but they possess, for the first time, a small amount of discretionary income above bare survival. In many countries, this group is, or will soon be, the largest segment of the population. For the first time, these hundreds of millions of households are starting to figure as prospective customers in the market analysis of companies around the world. There is also a transformation going on in financial services, built on these rising incomes and fueled by information technology breakthroughs. Now is a time of creativity and experimentation with new products, providers, and delivery systems for financial services – and, importantly, outreach to previously excluded clients. The responses of businesses and even nations to the opportunities presented by these demographic and technology shifts will create winners and losers. The winners will be companies that address this market while it is still relatively open, thereby securing their position in the world of the future. The winners will be nations that open their financial systems to the creative business models needed to serve these new customers, and thereby promote a productive and connected citizenry. This is the message of Financial Inclusion 2020, a project of the Center for Financial Inclusion at Accion. Financial Inclusion 2020 has conducted an extensive consultative process through five working groups with over 40 total members from over 30 countries and input from over 100 reviewing experts. These groups have created a series of roadmaps to inclusion on each of five topics: financial capability, addressing customer needs, technology-enabled business models, credit reporting and client protection. The Center is grateful to all the participants and partners – CGAP, the World Bank and the IFC among them – as well as key project sponsors Citi, Visa, MasterCard, the Gates Foundation, Western Union, Met Life, and others. The roadmaps caution that although winners will emerge, the opportunities can also easily be lost if those pursuing financial inclusion fail to recognize and respond to the unique character of the new market. Several of the Financial Inclusion 2020 working groups concluded that purveyors of financial inclusion urgently need to shift to a more deeply customer-based perspective. That is because the people in the vulnerable class are different. They do not imitate middle class customers in the rich world, even if they aspire to reach the middle class. Their experiences, beliefs, values and habits reflect their histories as poor and excluded. In their world, formal institutions like banks are not trusted partners. Businesses that succeed with these new customers will need to enter the minds and milieus of the vulnerable class. Why would a first time customer, for example, want a bank account? If cash is the only way for him to pay and be paid, perhaps he wouldn’t. What private or cultural aspirations motivate a woman to save? What preparations are mature adults making for their old age? Successful “includers” will draw on the rich knowledge that already exists about the financial lives of the previously excluded, and they will spend time directly listening to these prospective customers. Businesses must always hear from customers, of course, but in this case the mindset gap may be especially large and bridging it will require unusual responsiveness. Businesses that succeed will also recognize the special financial capability development needs of customers who have never used formal services. They will begin to use every client touch point as an opportunity to inform clients and assist them to develop confidence through “learning by doing.” They will take advantage of technology to create dialogue with customers, while guarding the instances when face-to-face works best. The roadmap on financial capability highlights the insights from behavioral economics as an important source of guidance on how to build financial capability. It encourages businesses to partner with behavioral economics experts in their product design work. Businesses that succeed will also embrace consumer protection. Whenever a new customer segment comes on stream, businesses face a risk that early bad experiences can taint perceptions in a viral way, even if unfairly. With this new segment – inexperienced in the use of formal services and often of limited literacy or education -that risk is especially striking. And the very business opportunity that draws providers to this new market will also attract the less scrupulous or outright fraudsters. For these reasons, it is in the interest of providers seeking to address the base of the pyramid to work with both their own staff and like-minded providers to ensure that the marketplace is distinguished by strong consumer protection standards. The working group on consumer protection envisioned consumer protection principles becoming a core part of banking’s professional identity. The national social and economic goals of policymakers and regulators will more likely be met if they, too, enhance their customer perspective. While providers have only their own investments to lose, for policymakers the whole market is at stake, and that makes mis-steps very costly. Market risks that affect whole population segments can arise from weaknesses in consumer protection regulation, and governments also have a strong interest in promoting financial capability – either directly or through schools, media and social organizations. Governments can also make it easier for providers to enter this market by carrying out (or commissioning) demand-side research and data collection and making the results available to providers as a public good. And of course, regulators have a great deal of work to pave the way for new technologies and providers. These observations reflect a sample of the findings from the five Financial Inclusion 2020 roadmaps, released this week. The roadmaps offer recommendations ranging from broad principles, such as discussed here, to a host of specific action points. They are intended as vehicles for dialogue and consensus building. Financial Inclusion 2020 will now enlist the collective insight of a broader group of stakeholders to distill the Roadmap’s thinking and help implement action at the FI2020 Global Forum in London on October 28-30, 2013. The Forum will bring together leaders from the public and private sectors to promote a global agenda for bringing about the financial inclusion of more than 2 billion people around the world, using the year 2020 as a focal point. 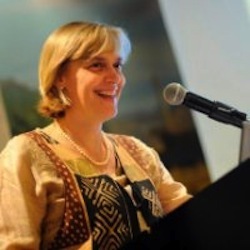 Elisabeth Rhyne is Managing Director of the Center for Financial Inclusion at Accion. Editor’s note: this post was originally published on CGAP’s blog, and is cross-posted with permission.